the Dam Sen Theme Park in District 11, the National History and Culture Park in District 9, the Ben Duoc Memorial in Cu Chi District, the administrative center of Can Gio District, the Hiep Phuoc Industrial Park in Nha Be District, and the military command of Binh Chanh District. 6/2 - 10/2 (Mung 2 - Mung 6 Lunar Calander): Opening from 9:00 - 22:00. - From 27 to 29 Tet (01 to 3 February 2016): open from 6 am to 24 pm. - Day 30 Tet (February 4, 2016): open from 6 am to 12 noon. 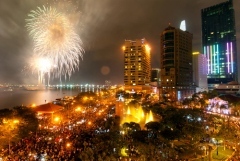 - New Year's Day (February 5, 2016): Tet holiday. - From the 2nd to 5th day of the Lunar New Year (June 6 to February 9): open from 8 am to 12 noon. - Day 6 of Tet (10 February 2016): opening the door to operate normally. - From 05 - 11/02/2018 (from 20 - 26 T?t): Open from 7am to 23pm. - From 12th to 14th February 2015 (from 27th to 29th of Tet): Open from 6am to 24pm. - 15/02/2018 (30th day of the Lunar New Year): Open from 6am to 12pm. - From 17 - 20/02/2018 (2nd - 5th Lunar New Year): Open from 8am to 12pm. LOTTE Mart　District 7, LOTTE Mart Go Vap, Lotte Mart Phu Tho, etc. LOTTE Mart Go Vap and LOTTE Mart Tan Binh：open from 7am to 12pm. - Big C Nguyen Thi Thap District 7 from the 24th lunar day on 9-Feb, open from 7g to 24g.